Let's cut to the chase: I loved this from my first bite and I can't wait to have it again. The secret was super fresh, super flavorful brownie dough chunks. I was not prepared for how much brownie flavor I got from them. It was great. I set the bar low by expecting a ho hum blizzard that tasted like every other chocolate blizzard but I was wrong and I was in love. Yes, there are also thin chocolate shards in the mix. They add a little somethin' somethin' but nothing crazy. The chocolate sauce also plays it cool. It adds to the overall chocolate flavor without distracting in anyway. This one is all about brownie flavor (and I do love brownies). So yeah, great blizzard. It's simple but extremely effective. I hope you all get one as fresh as I did. So good and I can't wait to get it again. 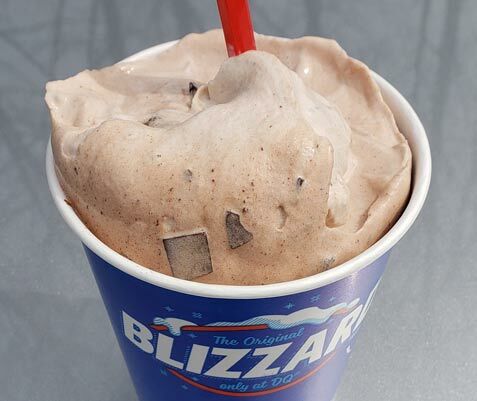 How does this compare to the regular Brownie Blizzard? Its essentially the same except one is Brownie Dough and one is Brownies. This had a ton of flavor that I don't remember the brownies having before. Maybe it was a fluke, it is DQ, but I enjoyed it very much.